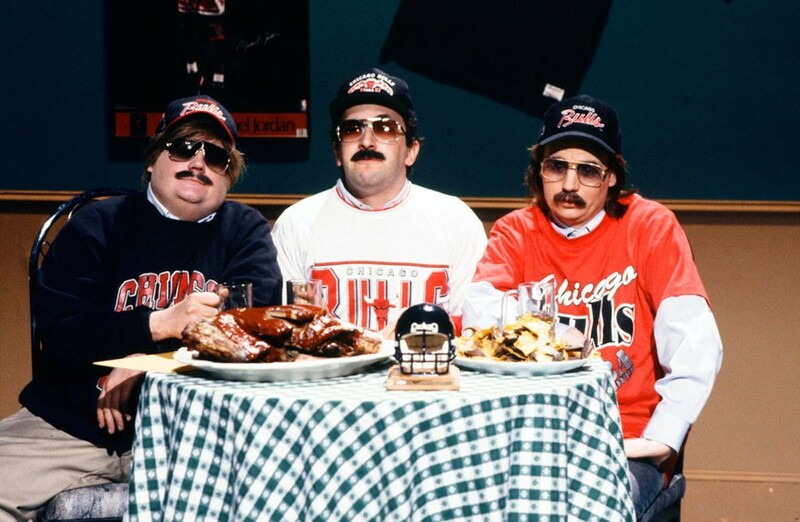 The Saturday Night Live sketch “Bill Swerski’s Superfans” lampooned Chicagoese. In the parking lot of a grocery store in Beverly, I heard the most Chicago sentence ever spoken. "Yeah," said a middle-aged man who could only have spent his entire life in the city's most Irish neighborhood, "dey're buildin' a new Cat'lick church out dere in Orland Park." In its most undiluted expression, the Chicago accent—dialect of Daleys, the sound of CTA announcements ("Customer assistance is needed at the key-ask")—is layered with local history: settlement, immigration, segregation, industrialization, globalization. Our city's basic speech patterns were brought here in the 1830s by Yankee pioneers from western New England and upstate New York. Stephen Douglas, the first great Chicagoan, was born in Vermont and died on a lakefront estate. The Yankees settled the lower Great Lakes, establishing a dialect region known as Inland North, stretching from Rochester to Milwaukee. From them, we got our nasal timbre and the pronunciations that evolved into the Northern Cities Vowel Shift, a 20th-century linguistic movement that has resulted in such distinctive midwestern pronunciations as "jayg-off" for "jagoff" and "Gapers blahhhk is slowing down tray-fic on da Day-en Ryan." Then came the immigrants, who adopted Inland North and added elements from their native tongues. Few languages other than English include the "th" sound. That's how "Throop" became "T'roop," and why "dese, dem, and dose guy" is a term for a salt-of-the-earth white ethnic Chicagoan, usually from the south side or an inner-ring suburb. The Irish "youse," a kludge for English's lack of a second-person plural, can still be heard in Bridgeport and Beverly. Next came the Great Migration. Isolated geographically by restrictive covenants, socially by taboos against intermarriage, and economically by relegation to the dirtiest, lowest-paying jobs, African-Americans had little contact with white Chicago and retained their southern speech. They still say "y'all" on the south and west sides. The midwest, which has the nation's most segregated cities, also has the widest divergence between black and white accents. The Chicago accent was most widespread during the city's industrial heyday. Blue-collar work and strong regional speech are closely connected: if you graduated high school in the 1960s, you didn't need to go to college or even leave your neighborhood to get a good job, and once you got that job, you didn't have to talk to anyone outside your house, your factory, or your tavern. A regular-Joe accent was a sign of masculinity and local cred, bonding forces important for the teamwork of industrial labor. A 1970s study of East Side steelworker families found that housewives were less likely than their husbands to say "dese, dem, and dose" because they dealt with doctors, teachers, and other professionals. After the mills closed, kids went to college, where they learned not to say "dat," and took office jobs requiring interaction with people outside the neighborhood. Chicagoese began going out of style right at the moment the rest of the country noticed it—maybe because the rest of the country noticed it. Saturday Night Live's "Bill Swerski's Superfans," starring Clearing's own George Wendt, lampooned Polish and Irish Chicagoans who gorged on "Polish sahhhsage" and rooted for "Da Bearsss." "It's become so stereotyped as a pronunciation, and it's pointed out so often in speech that people are actually shifting away from it," says David Durian, an adjunct professor of English at the College of DuPage, who has observed an erosion of the accent among post-baby-boom Chicagoans. McClelland's book on midwestern speech will be out in November from Belt Publishing. What does it mean to be midwestern? Belt Publishing releases two new books that examine the language of the middle of the country.